It’s Mother’s Day and I’m making dinner for mom tonight. I started thinking about it a few days ago when I was at the grocery store. It has to be something special. Now, “special” to you may mean something different than “special” to me. It doesn’t mean breaking the bank for dinner, although today you’re allowed. I would prefer to make something that is interesting, unusual and delicious, which often doesn’t mean costly ingredients. Whole artichoke and one in the process of bring trimmed. In fact, for part of my planned meal, one ingredient was very, very cheap. I stumbled upon artichokes at a local grocery. For 10¢ each. They weren’t quite what I would call “baby” but were not large either. Somewhere in-between. This is important. I got fooled the other day by green beans at one of our grocery chains. I had them in the refrigerator for 2 days before they started to turn brown. A total waste of money. 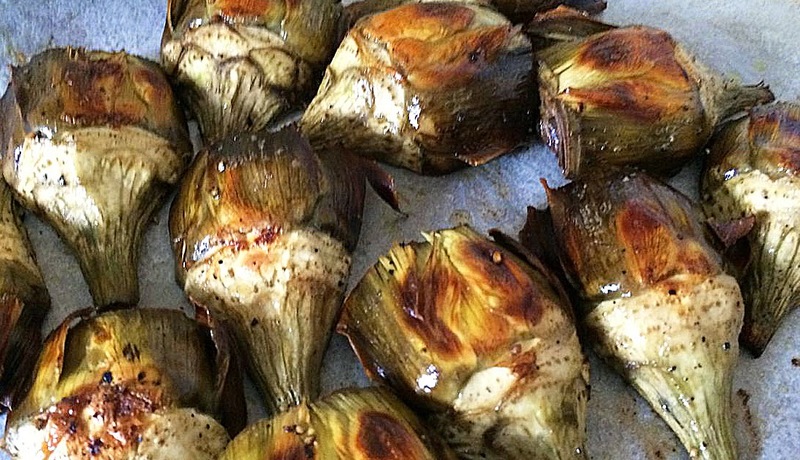 So how do you tell if artichokes are good, and what’s a simple way to prepare them? As you trim them, place them in lemon water. Number 1: how to confidently put them in your grocery basket. 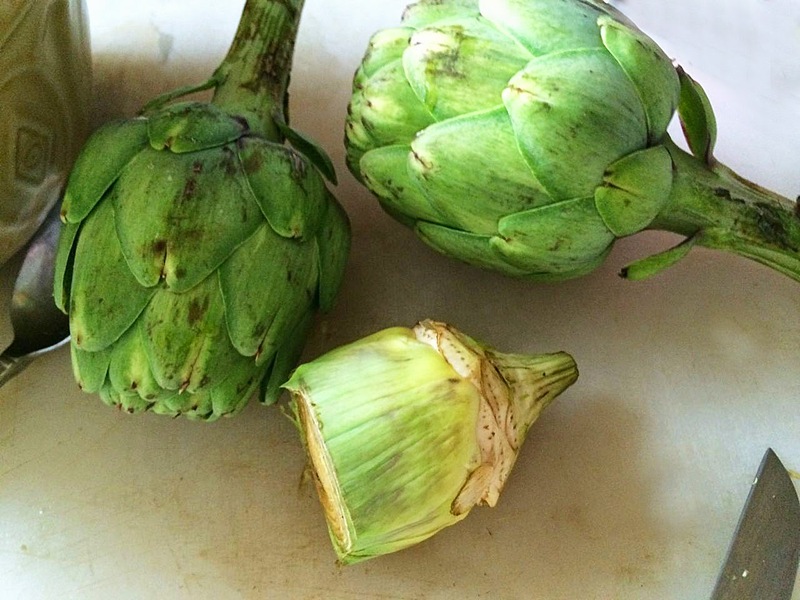 A good artichoke will be green with very little brown spotting, if any. The further you get from where they were grown, the more difficult finding pristine artichokes will be. The leaves will be tight together and it will feel heavy. If the leaves have started to peel out (like some kind of alien flower) the artichoke will lack flavour. Give them a good squeeze; the leaves should “squeak.” Check the stem, too. If it’s really brown the artichoke is most likely old. So you have them in your basket. Now what? Buy a lemon. You’ll need it. Since I was using these in a subsequent dish I chose to trim and roast them, but they can be cleaned and cooked other ways as well. The following is an excellent way to make them as a snack (with a squeeze of lemon) or for inclusion in the Mother’s Day dish I will post (hopefully) in a few days. very palatable so remove it. Baby artichokes will be OK. Number 2: prepare the artichokes for roasting. Take a bowl and fill it 3/4 with water. Add a few slices of lemon and a squeeze of juice. 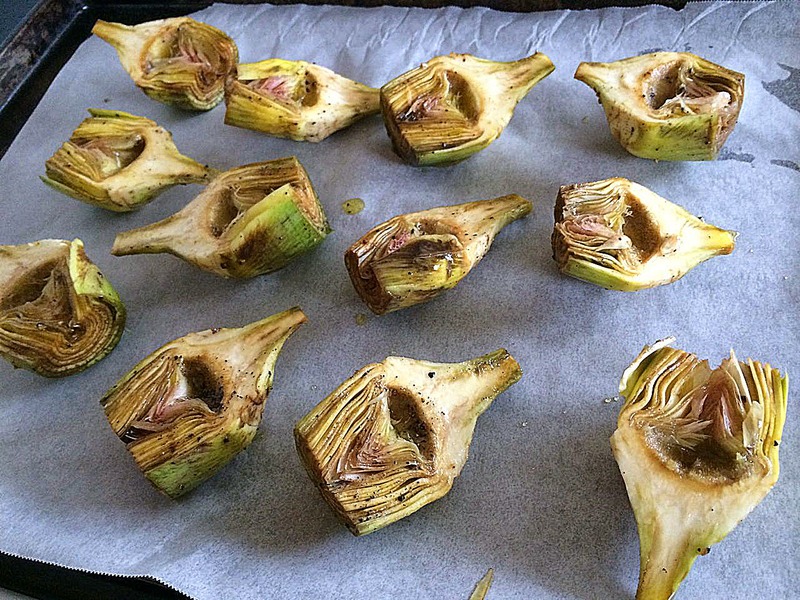 Artichokes turn brown very quickly due to oxidization when exposed to air. (Like apples when you cut them to make a pie.) So have this on hand. It’s called acidulated water. You can use vinegar in place of the lemon if you wish. Take each artichoke and start snapping off leaves, starting at the base. Continue to do this until you have exposed internal leaves that are yellow about 1/2 way up. Trim the area where you snapped off the leaves close to the stem. Trim the stem to 1” long an peel the remaining part of the stem. Then trim off the about 1/3 of the top of the artichokes. Finally cut it in two. 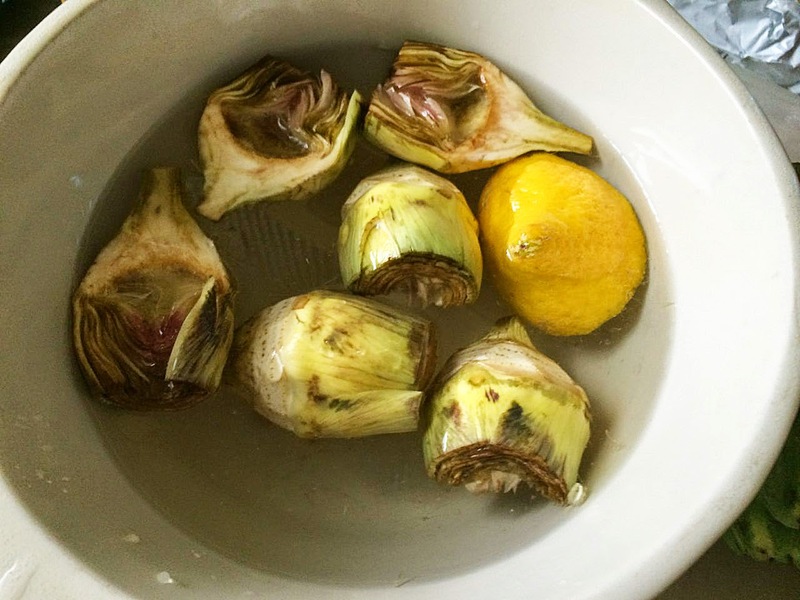 If you are using true “ baby” artichokes, simply place them in the water while you continue to clean the remaining artichokes. If the artichokes are more mature you will want to look at where the leaves emerge from the base inside. If it’s really “fuzzy” scrape the fuzz out. 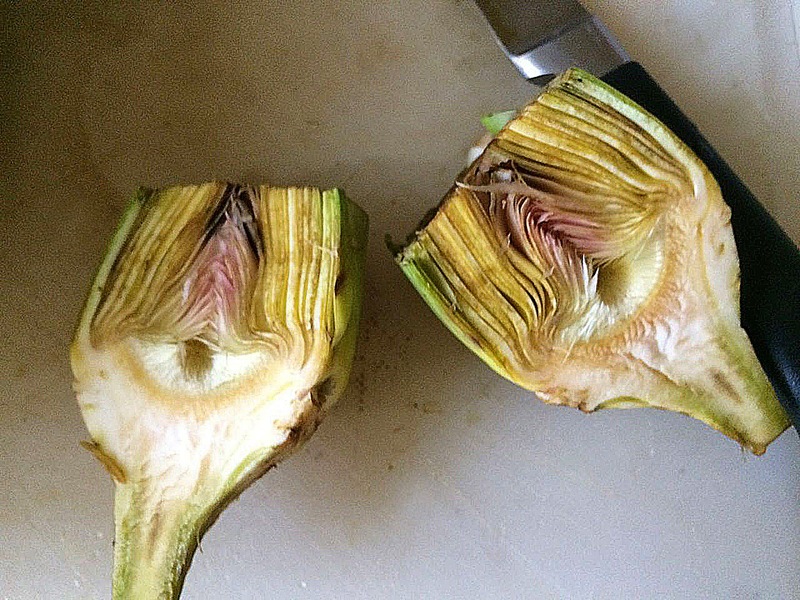 As the artichoke grows this area (the choke) increases and becomes unpalatable. I did remove it with a spoon from my artichokes, just to be safe. 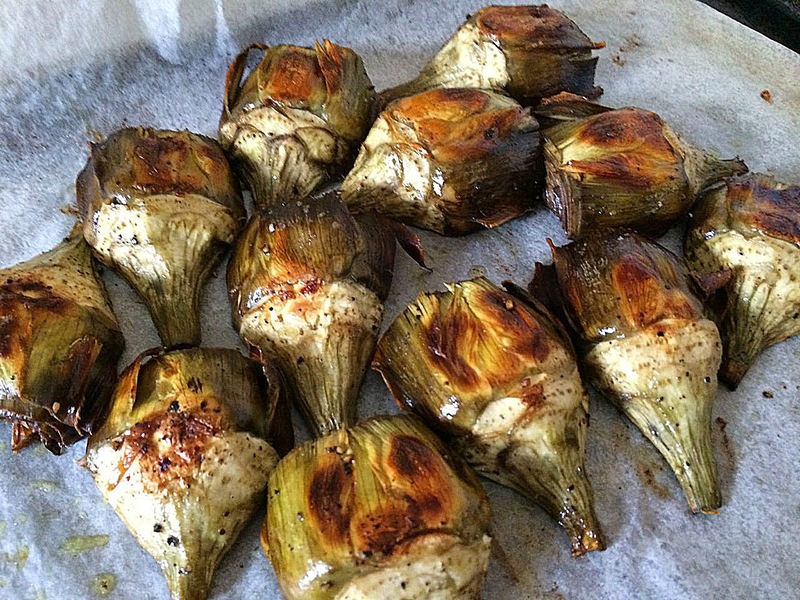 Once all your artichokes are cleaned, preheat the oven to 400°F. Line a baking sheet with foil or parchment paper. Drain the artichokes, giving them a good shake. Water gets trapped between the leaves. Add olive oil, salt and pepper and toss to coast well. Arrange the halves on the baking sheet and bake for 25 minutes, turning once while they roast. They are done when the base pierces easily with a knife and they are golden brown. They are now ready to be used in my recipe (lamb and artichoke ragù), or you can eat them "as is" with lemon squeezed on top, or a lemon-flavoured sauce. See – they’re not so intimidating after all! i sure love artichokes! i boil mine in lemon pepper and dip them in butter! I have always been afraid to cook fresh artichokes. Maybe I will now try them!